The Steelhead is know as the fish of 1000 casts. I have indeed found this to be true. I’ve been chasing steel for a while now, and I’ve been waiting patiently to check it off my list. It seems to be more elusive than other big river fish migrating toward their spawning grounds. It is undeniably the most sought after fish in the Northwest. Sure a Chinook can be nice and big, and any Salmon will be good eating, but the Steelhead is known for it’s fight. The kind of battle that turns you into a full blown addict. I spent a long time learning how to fish for Steelhead, and put many hours in on the river with nothing to show for it. Nothing at all, until today. Today I finally checked the king of the river off my list. Today I landed my first Steelhead. I think it was about eight or nine years ago that I decided to start fishing for Steelhead and Salmon. I purchased my tags and told my dad I wanted to catch one. He fished for them pretty heavily back in the 80’s. It was a bit of a different game back then, so some of his tips were a bit dated, while some were tried and true. He gave me a spinning rod and reel combo big enough to handle a Steelie, and showed me how to drift fish. I rigged up with a 2 inch piece of hollow lead attached to the tag end of the line coming off my swivel, and a corkie and yarn on my leader. I let it tick along the bottom, and I can still hear my dad saying “If it stops give it a tug, it might be a fish!” It was however, mostly just me losing my weight. None the less it was great advice for river fishing. To this day, any method I use involves getting snagged on the bottom over and over until the bottom tugs back. Over the years I would go to the river occasionally to cast my line out and try my luck. I never took into consideration what type of water I was fishing in, or whether the method I was using was right for the type of fish that were running. On top of that, I never put the time in. I would try very sporadically to fish on rivers, or just opt out to fish for trout in lakes where I know I would catch fish. This all changed last year when I landed my first Salmon, a big 30 lb Chinook. I didn’t know what I was doing, I just tied a Blue Fox lure to my braided main line, and cast out a few times. Luck was with me that day because I connected with a fish. Little did I know at the time, but that was a moment that set off a chain of events that not only made me a better fisherman, but also led me to my first Steelhead. I was actually hoping to get a Steelie when I hooked up with that Chinook. I had watched someone bring in a nice summer run Steelhead about a month before, and it really got the gears turning in my head. Once I landed that first Salmon I began reading books about fishing, talking to anyone who would chat with me about fishing, and chasing fish wherever they were supposed to be. It became my obsession. I ended up having an amazing time fishing for Coho last year, getting into some very memorable battles. Still, in the back of my head I yearned for that legendary fight with the mighty Steelhead. I read as much as I could about the majestic fish, learned how to make my own lures, and watched countless videos of people catching them. I spent all of my free time studying for that glorious moment when I would finally feel the tug of a Steelhead. With the winter Steelhead season finally upon us I enlisted the help of a guide to help get me into some fish. We set out on a good weekend with perfect weather and beautiful water. The river was crowded, and the action was slow. There were very few fish landed that day, and none were for us. It was still a valuable experience, as we did everything right. If the fish had wanted to bite, we would have had them. 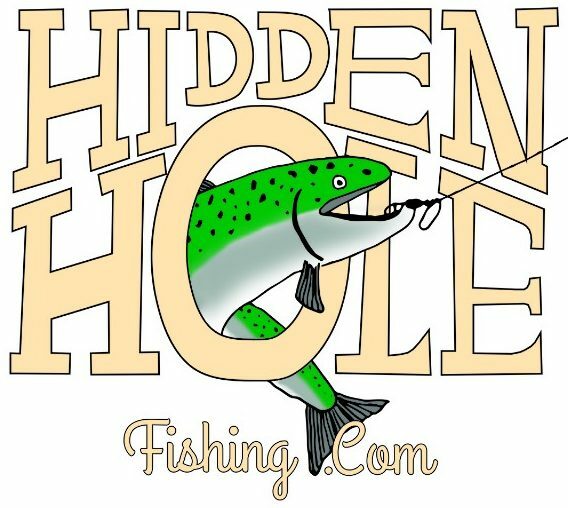 The guide, Jeff Stoeger was excellent, giving me lots of advise, pointing out great holes, and really going the extra mile to get into some fish, even when the outlook was dismal. Most importantly I gained a ton of confidence. Fishing with an expert, and getting their commentary on how you are fishing, and whether what you are doing is right, is invaluable. Coming off the trip with Jeff, I knew I was nearing my 1000th cast. I had all of my gear rigged up and ready to go. I had one rod with a bobber and Jig, one for bobber dogging, and one for my favorite; spinners. On Monday before work I hit a hole running the bobbers through with a couple of questionable “bobber downs” then I went to the spinner. It’s a fairly deep hole so I cast it out and let it sink for a while before beginning my retrieve. I worked the spinner through the hole a few times, when I felt a tug. I pulled back, and felt tension on the line. There was a powerful fish on the other end for about three seconds. It was an experience that was as heartbreaking as it was inspiring. I now knew I had what it takes to connect with the amazing Steelhead. On top of that I was using my ‘Silver Standard’ lure. I went back the next day looking for my fish. Again I spent some time drifting the bobbers, but couldn’t get that spinner bite off my mind. Finally I began hucking my lure again. On one of my retrieves I had what felt like some debris stuck on the lure, but I continued at an even pace. It started to hang up like it was snagging, then there was a tug. I pulled back to set the hook, and saw a big flash maybe 10 feet in front of me. I watched it shake it’s head and spit the hook, and just like that, it was gone. Once again, heartbreak and inspiration. I knew my fish was coming soon. This morning I set out to that same hole, conditions and weather were perfect. Again I worked bobbers with beads, jigs, and worms. There wasn’t much action other than a few “bobber downs” that could have been fish, but probably weren’t. Knowing that I had two encounters this week with my spinner, I couldn’t help but put it out there again. I worked it through a few times, the water was a little higher and faster, but still I was pleased with the action of the lure. After loosening it from snags a few times it stopped on a retrieve, and this time it was a fish. It ran, then I tugged back and reeled up on it, bringing it closer to me. It pulled again letting me know it wasn’t a suckerfish, the fishing equivilent of fools gold. I knew it was a good size fish, but it wasn’t running real far like I knew a Steelhead should. When I got it in I saw I hadn’t landed the Steelhead I had been dreaming about, but rather a spawned out Chinook, or a zombie fish. It was probably 20 lbs, and overall gave a good fight, perhaps it’s final battle. I have no doubt that in it’s prime it was a fierce competitor. It was exciting, and it ended a drought that had started for me back in November, but it wasn’t my Steelhead. I continued working that hole for a while, but felt ready to resign. I ended up leaving around noon, and decided to head a little further upriver. I went first to a hole that was crowded, and didn’t like the access I had. I didn’t stay long. Next I headed to another hole nearby, it was even more crowded. I sat in my car for a few minutes contemplating whether I wanted to even try. I decided to just grab a couple of my rods, left my net and tackle in the car, and headed down to the water. I snugged in between two groups of people fishing. First I tried bobber dogging, but didn’t have enough room to get a good drift going. Then I went back to my trusty spinner. I cast it out once and about midway through the retrieve there was a tug, and I set the hook. It jumped and then dove down taking some line off, letting me know I had a good hookset on it. My heart was already pumping and it raced downriver. Now I knew I was fighting a Steelhead. It went probably 50 yards down before I got it to stop and turn back around. I worked it toward me slowly before it decided to run again. I worked it in again and had it in front of me. I began backing toward the bank and it took off too. I brought it in again, and it was tugging, and full of power. Finally I got it in, and saw that I had a fin-clipped winter Steelhead. I was elated. It was a beautiful 8lb buck, and I finally checked a big item off of my list. Looking back at all of the time and money spent in preparation for that moment, I can say without hesitation, that it was all worth it. Taking the time to learn what I was doing had paid off. Persistence and confidence were keys to my success. 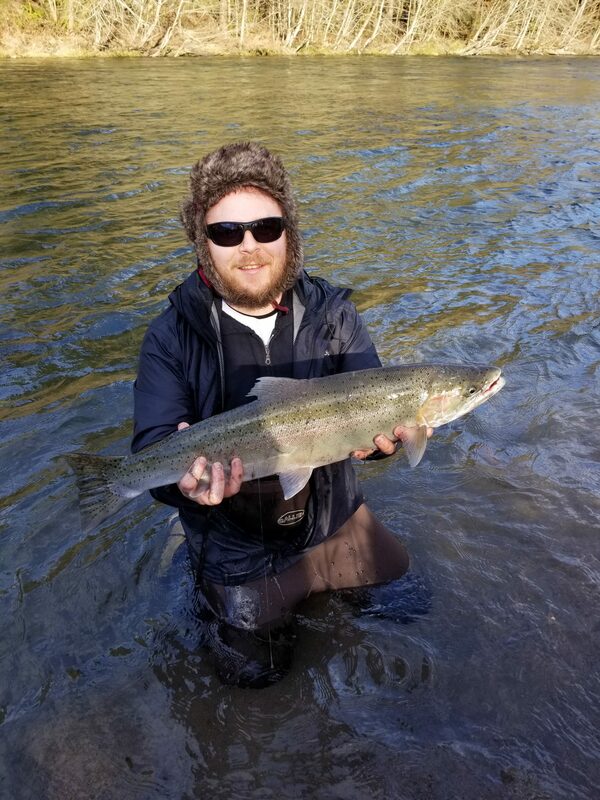 Keeping an open mind, and always taking the opportunity to learn something new led me to my first Steelhead, thus closing a big chapter in my journey as a fisherman. Though this chapter has come to a close, I know that every ending holds a new beginning.